When it comes to my spring and summer wardrobe, there’s always one thing I shy away from – anything that’s a hassle. If its difficult to wear, clingy in the wrong places, too hot or requires more effort than I have patience for (which is not a lot), I’d rather not bother. That is why I’m such a fan of fun, bright items that spruce up a look effortlessly. Especially when that fun, bright item takes the form of a tassel. Two tassels, rather. For your ears. Tassel earrings. Hello show stopper. I received this pair from Lisi Lerch, whose repertoire boasts of vibrant, poppy pieces, and have already dubbed them “accessory of the season.” Taking the color theme and running with it, I added an aquamarine Lilly top and breezy mint shorts for a splash of summer. White nails and this delicate cross bracelet by Gorjana kept things anchored in the midst of so much color. And the best part about the look is how light and comfortable it is! Texas heat has already blessed us with it’s presence, and it’s not long before temperatures reach suffocating heights. Luckily, I’ll have this little number to throw on for evenings out and about. And I won’t have to worry about being too hot. Ask any Texas gal – that is music to the ears. Even more reason to celebrate? You can win a pair for yourself! Enter the Rafflecopter widget below, and cross your fingers extra tight! The giveaway will run until May 11th at midnight CST, so the lucky winter will receive them just in time for her summer soirées! I can’t wait to twin with whoever that is this summer! P.S. A big ole hug to Brighton for stepping in as photographer! P.P.S. Austin ladies, I hope I get to meet you tonight at the Kelly Wynne Fiesta! Click here for all the details! I love the pairing of the different shades of blue! I love this giveaway and I love your blog! Can’t explain how excited I am for this post, I LOVE these earrings and have been wanting a pair for months! They look great on you! i accidentally commented on the wrong post hehe but i’m obsessed with this color combo! i’ve been lusting after these earrings for awhile!! xoxo! Those colors looks fantastic on you, Kate! You look great! Loving the simplicity yet unique style of this outfit! Once again one of the many reasons I continue to look towards you for putting together outfit ideas! Absolutely adorable summer look. Love those shade of blue and those shorts are too cute!! I’m crossing my fingers real tight! :) this is really a fun staple accessory for spring and summer. living in kansas city right now, i totally understand the need for light and airy pieces! holy humidity, this california girl was shocked nearly to death when she first got off the plane! loving this chic look and those tassel earrings, i die, i am so in love with everything tasseled and pom-pomed right now! That orange has already been chosen as my color of the season, it’s fate! You look so cute, which that is the norm for you. 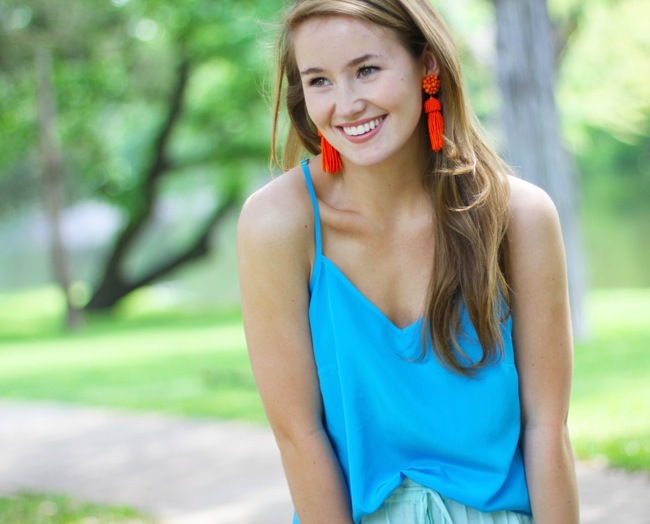 The tassel earrings are the icing on top! Thank you for the giveaway opportunity. Those are so cute. Thanks for the giveaway! Love these earrings! And your blog, I look forward to each new post! Love those earrings! Fingers crossed! Absolutely love Lisi Lerch! These earrings are a dream! I am in love with this color combo girly! Such a pretty look!